This entry was posted in My Top 200 Photos and tagged cat, cute, face, photo, photography, sewie. Bookmark the permalink. I would never call a cat Buddha. Buddha is supposed to be peaceful and benevolent, and cats kill everything; Sewie is a much better name. Yep, or Maximillian Octavius the III, Slayer of Many Things. Love the ‘plugged in’ look. 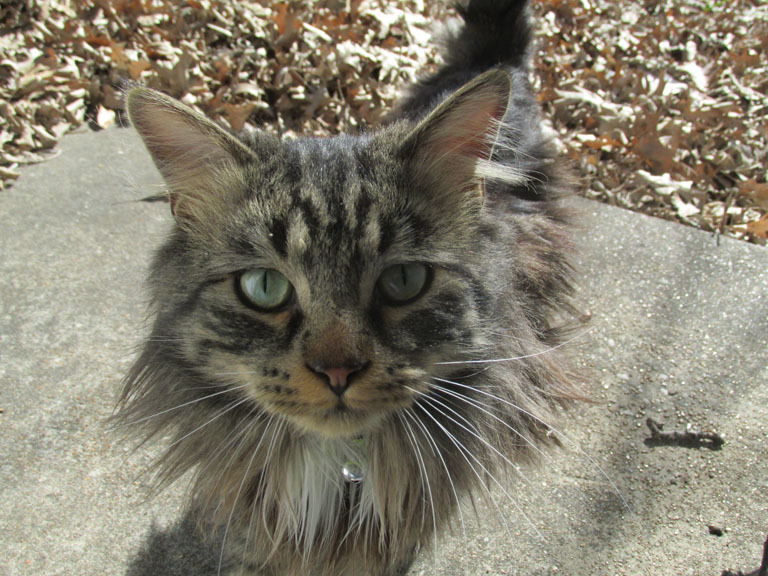 I’ve been fortunate to have some really cute cats wandering about the neighborhood. And yeah, most cats are cute by nature, but Pretty Kitty, Sewie and Gypsy are all exceptionally beautiful! Oh yes, this photo is a real jackpot! I have only one cat photo above this in my countdown… which is how much I think of this gorgeous picture! Sewie was a real hunkahunkacat alright – very photogenic and yep – I see “put that danged camera away and bring out the foodables mister! !” look on that cute face. Yeah, I know I’m cute… but I’m also hungry and want to eat NOW! Geez, where are these cats’ priorities? He’s giving you that hypnotic “gimme tuna” stare. Well, that look doesn’t work on me (drops open can of cat food on porch)…. I swear that now I’ve got at least three squirrels, a couple of dozen birds, and three dogs and they ALL have that look. This is one of the few photos I took of him when he didn’t have his head down… and I had a bunch I deleted. I love his extra furry features! He’s a very handsome boy!